Tucked away in “Middle Earth”, otherwise known as Mansfield, Ohio, is the historic and infamous film location for the movie ‘Shawshank Redemption’ (and recently several ghost hunting shows). On July 13th (Friday the 13th! ), 14th, & 15th, it was also home to some of the biggest names in Music, tattooing, and the HellzaPoppin freak show. and Black Label Society (who headlined Sunday night July 15th) were among the bands that took the stage at Inkcarceration. and as you walk through you can feel the presence of the ghosts of past. If you look out the back windows you can see (but not photograph or video) the felons in the yard of the active prison located directly behind the former. It is spooky beyond words. For the fans that came out to get inked, they were fortunate to get a prison tattoo done by a pro. That is right – inside the prison, artists set up and went to inking all those who were ready for one of the most surreal ink experiences ever. Don’t worry – there was no pens, toilet water, paperclips, or rubber bands used to tattoo you. These prison tattoos were done by masters of the craft like Wave Judd who took a quick 2 hours out of his day to tattoo bass player Guy from Akadia. You can see footage of that at tattoo.com taken by Rockwell Anderson and Mischievous Mel. Other artists included Caleb Neff (brother of Ryan Neff, bassist for Miss May I) whose badass work earned him a first-place trophy and 3rd place plaque. Inkcarceration is a must from top to bottom. From the ghostly and macabre to the epic music and tattoo artists, this festival has a bit of something for all of us. 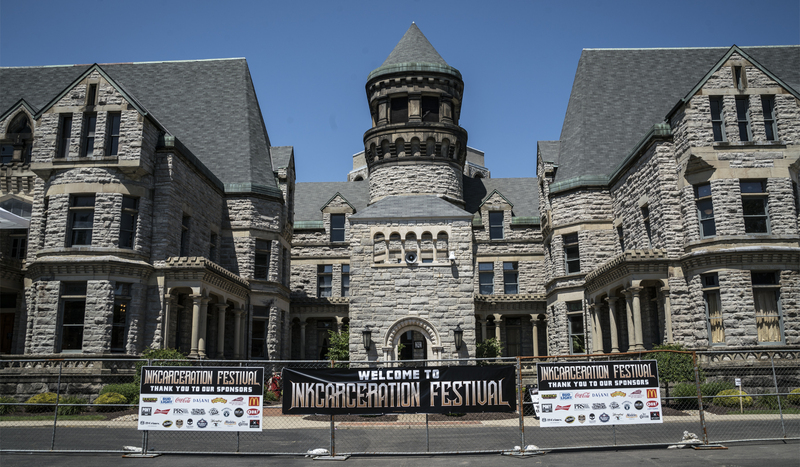 Personally, we can’t wait for Inkcarceration 2019!! !